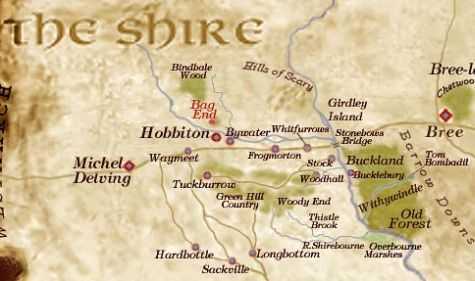 The Shire is the home of a small race of people called Hobbits. They live a simple life and care little for the events and news of the outside world. Hobbits enjoy a quiet rural lifestyle of farming, gardening and raising farm animals. They are largely ignored by the rest of the peoples of Middle Earth, although Dwarves pass through bringing bits of news on their way to the Eastern Mountains and Elves pass through on their way to the Grey Havens. The one bit of occasional excitement is when Gandalf comes through. Hobbits generally don't travel much, so it's quite an expedition for Frodo and Sam to undertake. Before they even leave The Shire, they see Elves, run into Merry and Pippin in Farmer Maggot's Field and have two close calls with Black Riders including one at the Buckleberry Ferry.